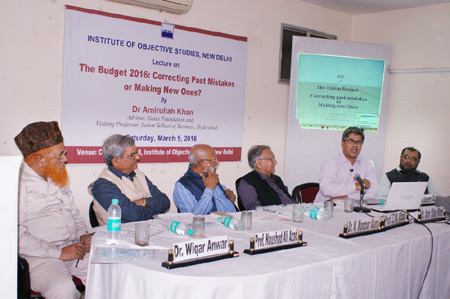 A lecture on “The Budget 2016: Correcting Past Mistakes, or Making New Ones” was organised by the Institute of Objective Studies at its Conference Hall on March 5, 2016. 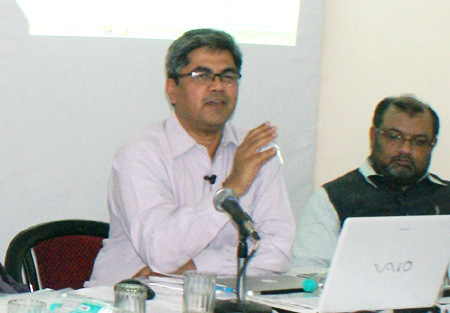 Delivering the lecture, Dr. Amir Ullah Khan, Advisor, Gates Foundation and visiting professor, Indian School of Business, Hyderabad, described the budget as the worst presented by any finance minister in the last few years. He said that the big disappointment with the NDA even for its own declared fans was that it was unable to match its own rhetoric and promises in what was its most important budget exercise half way through its term. Referring to the promise of bringing back black money stashed away in tax havens abroad, he said that not much success had been achieved. Another amnesty scheme had been launched after the failure of the previous one that delivered only Rs. 3,770 crore. The gold monetisation scheme that the Prime Minster endorsed returned a meager 900 kilogrammes of gold. Similarly, Cleaning of Ganga, Swachchh Bharat and bullet trains had all been largely ignored by the budget with no fresh allocations or increased outlays, he pointed out. Dr. Khan held that the budget’s single achievement was in declaring that the government was committed to its fiscal deficit target. The finance minister, Arun Jaitley, was promising that the government would not borrow any extra money despite pressure on him to invest more and create jobs. Private sector was not investing, but the government would not compensate by borrowing to invest more, he noted. As was to be expected, the share market responded with great enthusiasm and stock indices went up at the fastest rate in the last seven years. The corporate sector was happy that the government would not borrow more money from the market. What this meant was that there was enough money for the private sector to borrow from. It also meant that the Reserve Bank of India now might just be encouraged to reduce interest rates substantially and this might not take place before April, he said. He maintained that lower interest rates would mean cheaper loans which implied higher sales of cars, buildings and land. He said that beyond this achievement, the budget was a disappointment. The middle-class salaried employees felt cheated when they were told that 60 percent of their EPF (Employees Provident Fund) or NPS (National Pension Scheme) would be taxed on withdrawal. The complaint against the government was that it was now taxing retirement benefits, too. Commenting on the neglect of agriculture by successive governments, Dr. Khan regretted that India had witnessed sharp decrease in the rate of growth in agriculture. This came down from 4.2 percent in 2013-14 to 0.2 percent in 2014-15. Rural distress went from bad to worse as productivity fell, costs of inputs went up and commodity prices fell sharply. Rural wages fell sharply as farm prices went down. This, he said, resulted in rural demand declining, resulting in corporate balance sheets showing losses and capacities lying unutilised in Indian factories. Similarly, exports had been falling continuously since December 2014 leading to an increase in the trade deficit despite a fall in imports. He held that rupee had declined to its worst ever low and showed no sign of early recovery. As a result, the budget was expected to have some big and bold moves to resurrect agricultural, industrial and trade sectors. He said that while it did pay lip service to agriculture and the finance minister’s speech itself focused completely on farmers, there was nothing in the budget that would speak about industrial recovery, creation of jobs or the external trade sector. The infamous promise that was made by all the poll campaigners of the BJP that the black money would return to the country within 100 days and that each Indian would get Rs. 15 lakh in his bank account seemed to have been completely forgotten, he commented. Dr. Khan observed that there was a slight decline in the overall expenditure from 13.2 percent of the GDP in 2015-16 to 13.1 percent of the GDP in 2016-17. The size of the Union budget would increase from Rs. 17. 85 lakh crore in 2015-16 to Rs. 19.78 lakh crore in 2016-17. This meant an increased outlay of Rs. 1.93 lakh crore. He said that of the expenditure of nearly Rs. 20 lakh crore, nearly Rs. 5 lakh crore went as interest payment on loans taken. It was a pity that the subsidy amount remained high despite economic survey, prime minister and finance minister, all underlining the importance of reducing wasteful subsidies. The budget only reduced the subsidy amount from Rs. 2.57 lakh crore to Rs. 2.5 lakh crore, he noted. Highlighting other features of the budget, he said that barring increased allocation to panchayats, the government forgot every other sector. Housing, Sarva Sikhsha Abhiyan, minority affairs, nutrition, etc were serious issues that suffered from lack of budgetary support. The story, he said, did not change much despite the headlines that suggested a change in the government’s approach to development. Dr. Khan pleaded that direct taxes should be increased and the indirect taxes be cut in order to benefit the poor as they concerned the latter. Terming cess as bad tax, he noted that the loans advanced by banks had only added to the worries of the Indian economy. Commenting on capitalisation, he said that out of Rs. 4 lakh crore advanced by banks, only Rs. 25,000 crore had been recovered. This was due to faulty laws that protected big business. Referring to subsidies, he said that these would now be linked to Aadhaar cards for covering 80 percent population. The Central government had gone to the extent of treating the Aadhaar Card Bill as money bill to ensure its easy passage in the Lok Sabha. Striking a pessimistic note on exports, he noted that imports had become very expensive leading to the nose diving of the rupee. He believed that the annual growth rate might not cross 7.5 percent mark. Another grey area of the economy which required serious attention was availability of jobs. According to a rough estimate, about one million jobs were required each month. Thus the problem of providing jobs to youth passing out of educational institutions would confront the government. BJP had promised jobs during the electioneering in 2014, he concluded. 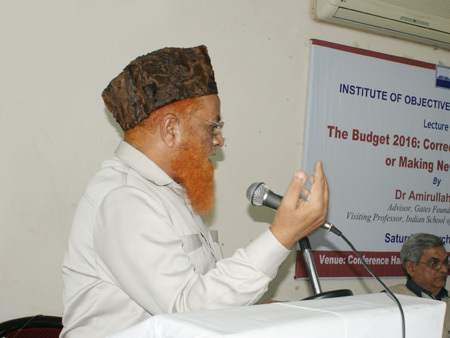 The advisor (finance) Jamaat-e-Islami Hind, Dr. Waqar Anwar, opined that the budget was a political document of the party that ruled. The promise to unearth black money was just empty rhetoric. In fact, black money was being protected, he said. The idea behind the budget was to provide certain facilities in the villages, so that the people who were in jobs in cities must return to their native places in order to maintain the character of rural life. While finding no fault with micro-financing, he said that managing 39 percent finances was always a liability for any finance minister. He held that the revenue totaled only 27 percent and we had to resort to borrowing from the market to pay interest. Dr. Kaleem Alam, Islamic Economic Institute, King Abdulaziz University, KSA, expressed his reservations about taxing the EPF and referred to the number of cases relating to the income tax pending disposal in courts. He called for caution on throwing open the door of defence production to the private enterprise. 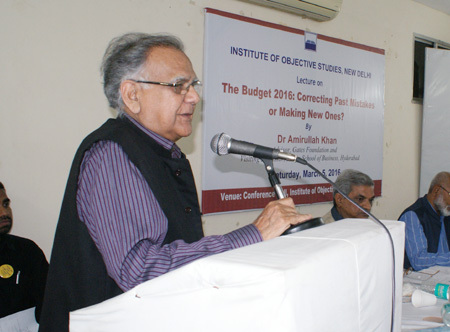 Former dean, faculty of social sciences, Jamia Millia Islamia, Prof. Naushad Ali Azad, observed that at a time when the Chinese economy was experiencing a downward trend, India had a good opportunity of growth. Commenting on the budget, he said that it was positive as far as agriculture was concerned. Against the backdrop of dismal performance of the manufacturing sector, private sector had enough opportunities to grow as growth was necessary for business. He held that social harmony was a prerequisite for economic progress. Thus social cleavages should be taken care of, he added. 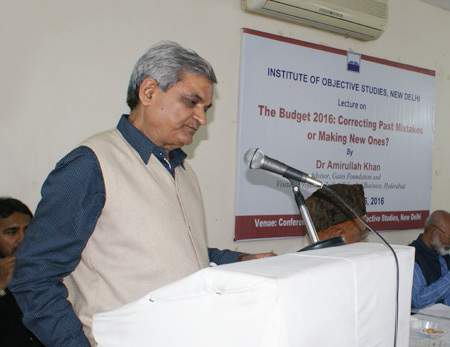 The Secretary General, IOS, Prof. ZM Khan, said that the budget ignored the common man by not giving a fair deal to rural areas and the minorities. He rejected the idea of comparing our economy with that of the US. Rather, it must be compared with the African countries like Uganda and others. He hit out at bureaucrats who prepared the budget by saying that it was political economy rather than an economy, a priority of the present government. 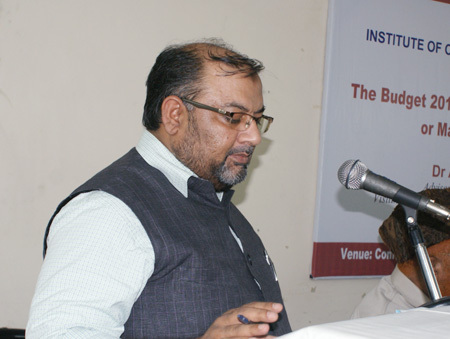 The Chairman, IOS, Dr. M. Manzoor Alam, in his presidential remarks warned of the anger brewing among the youth. This was a socio-psychological problem of the youth which grew out of unreliability, indecisiveness and anger. In order to vent their anger youth must be politically involved. He felt that tension among the youth would continue for the next twenty years. The lecture began with the recitation of a verse from the holy Quran by Hafiz Tabarak Husain. 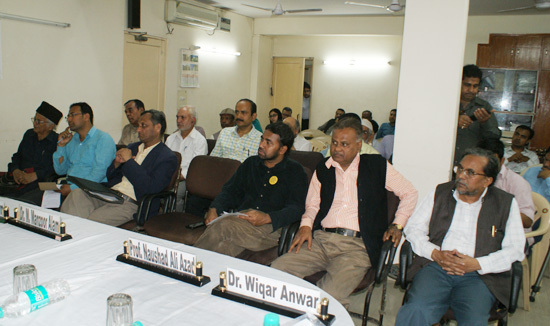 Dr. Aftab Alam, assistant professor of political science, Dr. Zakir Husain College, Delhi University, conducted the proceedings. A condolence meeting was also organised on the occasion to mourn the demise of an outstanding scholar and founder member of the IIIT, Dr. Taha Jabir Al-Alwani. At the end, dua was offered for him. 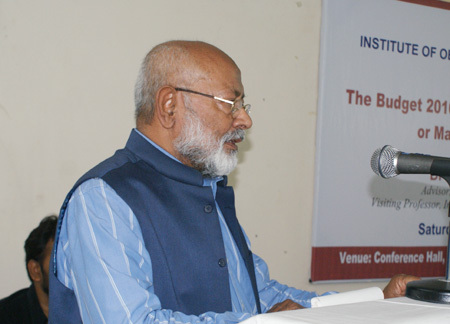 Dr. Nakhat Husain Nadwi conducted the proceedings of the condolence meeting. Prominent among the attendees included Mohsin Maqbool, Mohsin Javed, Mohammad Tanzeem Alam, Muneeb Faiq, Khalid Mohammad Tabish, Khairunnisa Aga, Zubair Arif, Mohammad Nadeem Bukhari, Mohammad Mushtaq, Syed Mehdi Hussain, Advocate, S. Haja Sahabudeen, Sabir Akhtar, Mohammad Zeeshan, Zahoor Ahmad Bhat and Safi Akhtar.